Samson's full name for this model is the Samson Airline Micro Camera System. 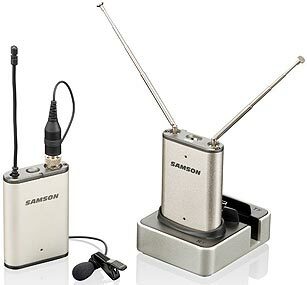 This ultra-miniature Beltpack/Lavalier/DC-Receiver System is aimed mainly at the DSLR pro video market for transmitting audio wirelessly to a video camera on location, but it can also, of course, be used to do the same job with a solid state sound recorder in the field. Clip the MICRO bodypack transmitter to the belt of the person you wish to record and its lapel mic to his jacket, then Velcro the MICRO's battery receiver-pack to your solid state recorder (or hot-shoe it to your camera with the adaptor provided), plug its output into the line input of your recorder and you're all set. Convenient wireless location recording on a budget. 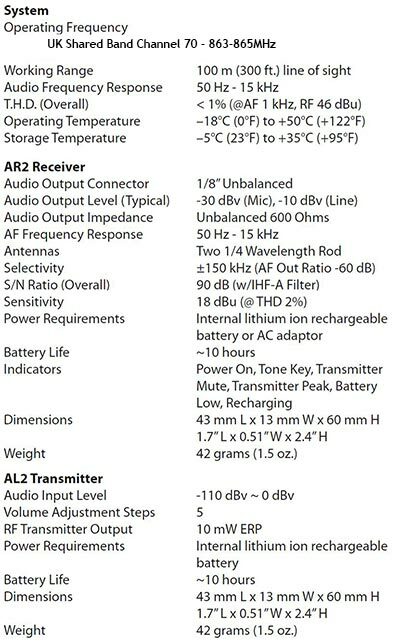 The MICRO system is available on TV Channel 70 which gives you a choice of 4 deregulated (legal and free to use) UHF frequencies [Channel 70-1: 863.125MHz; Channel 70-2: 863.625MHz; Channel 70-3: 864.500MHz; Channel 70-4: 864.875MHz].